John Wells’s phonetic blog: met a what? 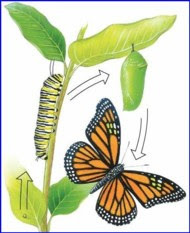 Metamorphosis, the singular form of metamorphoses, is one of those classical-derived words in which English speakers may hesitate about stress placement. In LPD, following Daniel Jones’s EPD, I give the main pron ˌmetəˈmɔːfəsɪs, with a secondary pron ˌmetəmɔːˈfəʊsɪs. M-W Collegiate and K&K give just the first stressing, as does ODP, although the Concise Oxford gives both, as does the OED (2001, for BrE; just the first for AmE). So why do some Brits, at least, want to stress the penultimate? Mainly, no doubt, because of other scientific words in -osis such as psychosis, neurosis, osteoporosis, cirrhosis, symbiosis, meiosis, tuberculosis, osmosis, hypnosis, sclerosis, all of which have penultimate stress, -ˈəʊsɪs. Those few who know Classical Greek will know the etymon μεταμόρφωσις metamórphōsis, and in English will know as usual to ignore the classical Greek accentuation in favour of the Latin stress rule. In the Greek spelling the omega (ω, ō) in the penultimate syllable shows that the vowel is long and therefore, by the Latin stress rule, stressed. Classicists and grammarians, though, may know the word apodosis əˈpɒdəsɪs (Greek απόδοσις apódŏsis) ‘then-clause’, paired with protasis ‘if-clause’ and having an omicron (ο, ŏ) followed by a single consonant in the penultimate syllable, giving a Latin and English antepenultimate stress. But then they’ll also know apotheosis (Greek ἀποθέωσις apothéōsis), which has an omega and therefore penultimate stress like the scientific words. Nowadays those of us who do know it say əˌpɒθiːˈəʊsɪs; but apparently that was not always the case in Enɡlish. Under -osis the OED comments “The older pronunciation of at least some of these words had the stress on the syllable preceding the suffix: see, e.g., the etymological note at apotheosis n.” Under apotheosis we read (OED of 1885) “The great majority of orthoepists, from Bailey and Johnson downward, give the first pronunciation [sc. æpəʊˈθiːəsɪs], but the second [sc. əˌpɒθiːˈəʊsɪs] is now more usual”. It is a bit unusual for me to lengthen that i in əˌpɒθiːˈəʊsɪs. LPD doesn't have a length mark. I suspect John took the transcription above from the OED. There, I imagine it is a figment of whatever (semi-automated?) process they used to convert the old NED phonetic transcription to IPA. It was probably considered 'safest' to convert both i and ī to iː. Thank you for confirming my suspicion that some weird piece of software is changing those old pronunciation transcriptions into the new system. I know that i and u as symbols have been discussed ad nauseam, and probably will be for some time to come, but whenever similar situations arise, I have to remind myself that i stands for a vowel similar to the de-lengthened iː, but not for iː. While M-W’s 11th Collegiate gives only ˌme-tə-ˈmȯr-fə-səs, M-W’s Unabridged gives ˌ= =ˈmȯ(r)fəsəs sometimes -ˌmȯ(r)ˈfōs-, so penultimate stress isn’t unheard-of in the US either. The Unabridged is NID3, which dates to 1961. It's completely unsafe as a guide to current pronunciation. If the m-w staff removed a pronunciation, they surely had good reason for it. The version from 2002 has: "=='mo(r)f&s&s sometimes -"mo(r)'fOs-. Which should be -ˈmɔː(r)fəsəs sometimes -ˌmɔː(r)ˈfoʊs-. Well, yesterday I had to unlearn /kamy/ Camus, and now I have to unlearn /æpəˈdoʊsɪs/ too, it seems. I have to “unlearn” əˌpɒθiˈəʊsaɪz. That is to learn əˌpɒθiˈəʊsaɪz and “unlearn” -ˈpɒθ-. And according to "The world's most trusted dictionaries", pneumonoultramicroscopicsilicovolcanoconiosis ends with -ɪʃ. Presumably because you need a stiff brandy before you can finish saying it. I misunderstood what a francophone was telling me; Camus is certainly /kamy/. Arrgh. How do other languages handle it? German (Metamorphose), Spanish (metamorfosis), and Portuguese (metamorfose) appear to have penultimate stress, while Italian (metamorfosi) has antepenultimate. and for Russian, Wiktionary has метаморфоза mʲɪtəmɐrˈfozə though the Wikipedia article uses метаморфоз (-ˈfos, with presumably -ˈfoz- in oblique cases). I don't see any relevance to this, unless one thinks, say, the English word was from (Graeco-)Latin, but then reintroduced from French at a certain time, or the other way around, that a language took it from English and so can witness about a stress at a certain time. In Russian метаморфоза is the general term. In biology метаморфоза can be used alongside метаморфоз. Frankly speaking I don’t see a relevance to the contemporary English speaker in any of the above mentioned etymologies. These days virtually nobody places their accent in an attempt to follow Latin or Greek usage. Such considerations are often useful to shed light on the history of what has come about, and that’s where their usefulness ends. Transferring files via Bluetooth often seems to be the most accessible method but in reality.